I worked at Ansonia this past Saturday and decided to pour both a light red and a white. 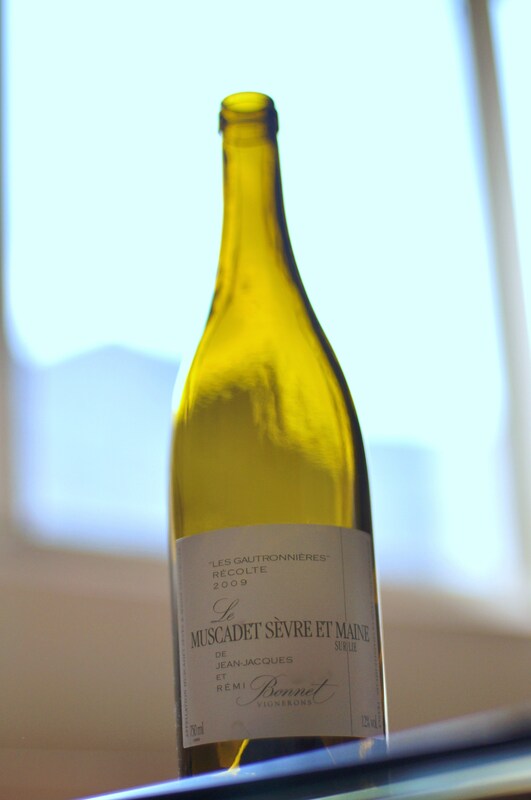 I decided to pour this wine because I had never had a Muscadet I’ve liked–till now. Muscadet is produced in the Loire Valley (site of excellent Sauvignon Blanc, Chenin Blanc, and apparently Pinot?) from the Melon de Bourgogne grape. Muscadet is produced in three sub-appellations, of which Muscadet-Sèvre et Maine is one. Although it’s a bit obscure, Muscadet has been acknowledged by some gourmets (and gourmands!) as the perfect oyster wine. This wine has a nice hint of spritziness, not quite as pronounced as in a Txakolina, but perhaps around the same amount as some Vinho Verdes. Very nice citrus stone fruit nose. Clear, light body with some citrus and very pronounced minerality–definitely not like a Chablis or Sancerre but still pretty assertive. Not the longest finish, but one that ends when it should and ends well–sort of like this. It avoids that plasticine taste I hate in many inexpensive wines, and when it warms a bit it even seems like it could be a Chard. A nice ending indeed. This is THE PERFECT wine for summer. Forget rosés (and you know how much I love rosés)–this is what you want to drink when it’s hot and humid outside. It’s a wonderful aperitif and would go well with seafood, especially shellfish and ESPECIALLY oysters (when they’re in season again, which is generally any month containing the letter “R”). This is a wine you want to pick up by the case and drink by the bottle. But, as I seek to foster online conversation about wine: what are some of your favorite wines for summer? Would you say it is closer to vinho verde than a trad. muscadet? My first worry was that it would be too sweet, but your review rather crushes that notion. All the foodie mags do seem to have gotten together on the rosé talking point, to an extent that it almost off-putting. I can barely turn around but to hear praises sung. Regardless. The best summer wine I have had so far, for those as white wine wary as I, was a Pecorino Colleventano. It is an Italian wine. It was described as a white that drinks like a red, but lighter. I preferred it to most rosés because it held onto qualities I like better, while still being refreshing and light. I do not have gobs of details on it. My guess is that it either is relatively rare or something that typically goes by another name. Hmm–perhaps like a cross between a Sauv Blanc and a Vinho Verde? It’s definitely not sweet–it’s fantastic! Indeed. In the words of Hansel, “rosé is so hot right now.” I can’t help but feel a little bit happier when I am holding a nice cool glass of rosé. I’ve never heard of or had Pecorino Colleventano: it makes me think of cheese. =) If you could somehow procure a bottle and bring it back to DC for me to try I would not only be indebted to you, I would also provide you with return alcoholic consideration! You’ve never had a muscadet you’ve liked before this? Ridiculous. You must seek out Domaine L’Ecu or Louis Papin. Both Exceptional and completely dry, very complex and amazingly priced. Probably below $20 in your market for a wine worth twice as much. I agree–it was ridiculous, especially since the one I had was so delicious. I will look out for the two you recommended!